The LG G Flex 2 I tested this month isn’t the world’s first curved smartphone, but it is the first one that has the muscle to back up its constant, ostentatious flexing. This concave Android phone is the follow-up to the 2013’s LG G Flex and, while it bends the same way, it has new dimensions and a much better display that make it less of a gimmick. Going with that new, more manageable size is a high-resolution P-OLED touchscreen that’s 1080p, up from the decidedly deficient 720p display of the original. With a faster Snapdragon processor, speedier RAM and Android 5.0 Lollipop on board this banana-shaped phone, the LG G Flex 2 is both trendy-looking and powerful – most of the time. Straight from South Korea, the LG G Flex 2 I tested is available on only one carrier in the US and the UK. In the US, Sprint is the first network with the phone, though AT&T has a vague “first quarter” launch. In the UK, Vodafone is the exclusive carrier for the first six weeks starting in March. How much does it cost? While it’s the equivalent of $737 (about £480, AU$943) without a contract in LG’s home country, Sprint’s charging $250 with a two-year contract and offering a $50 mail in rebate. All of a sudden $199 isn’t so bad. Without this deal or a contract, the LG G Flex 2 price is $504. Vodafone, meanwhile, is selling the curved phone for £19 with monthly plans starting at £39.50. There’s no SIM-free option just yet, but expect it to hover around £539. All prices are infinitely better than the original Flex that cost $700 (£690). As the name suggests, the LG G Flex 2 features a slight curve from top to bottom. That’s in contrast to the Samsung Galaxy S6 Edge, which curved on its right and left sides. It doesn’t radically change the look and feel of the phone like LG’s marketing would have you believe. Instead, the curve gives it a subtle bow in the middle so, like one of LG’s new 4K TVs, its faint curvature goes from a 400mm to a 700mm radius. It’s a little more durable by flexing, a little more immersive for multimedia viewing and a little better-sounding during phone calls. The Flex 2 felt contoured to my face and more accessible with one hand than a normal 5.5-inch phone. Throwing it under my foot several dozen times to apply pressure and straighten out the frame, the phone always flexed back into its original arch shape. I’ve seen the G Flex withstand 1,000 pounds of pressure, and LG claims this one is even stronger. It’s the ultimate anti-iPhone 6 BendGate phone. But more than anything, the G Flex 2 comes off as a trend-setting phone, even if a technical need for such a design is as subtle the curve. It serves to spice up the almost-always-flat and boring phone designs we see year in and year out. The Flex 2’s colors include Flamenco Red and Platinum Silver at launch, and I happily ended up with the more-striking red variant. To that point, the LG G Flex 2 attracted plenty of looks and praise from people I showed it to this week. Yes, it’s plastic, but it’s also extremely lightweight for its size at 152 g (5.36 oz) and feels natural in a pocket. It seemingly disappeared in my left pocket during a three-hour bike ride, whereas I my “smaller” iPhone 6 felt ever-present in my right pocket. That has actually been the No. 1 question everyone has had about it: how is a curved phone supposed to fit in your pocket? Remember, thighs – at least mine – are curved. And back pockets? You better believe that area is plenty curved too. The LG G Flex 2 actually fits better than any straight-shaped brick phone. In fact, the only two problems I’ve had with the curved design is getting a case to protect it and attaching it to my car windshield’s via an existing smartphone dash mount. That’s an impressive turnaround, but looking at the back cover, I still received what must be considered “medium” scratches that haven’t gone away. Sadly, it doesn’t live up to the hype – don’t put this phone in the same pocket as some teethy keys. Complimenting the Flex 2’s easy-to-grip tiny arch is the fact that it has no buttons on the frame. The side and top are free of the power and volume buttons I so commonly press on other phones that I grab. LG stuck with its design formula that puts them on the back cover. The placement will always be strange. It’s either a love-it wise decision or hate-it design flaw. Getting used to where the power button is was difficult at first and often led to inadvertent camera smudges. Taking screenshots of the Flex 2’s interface was also a problem. I can’t say I could ever get used to the back speaker, however. At a time when the top-rated HTC One M8 and its successor HTC One M9 are giving us front-firing stereo BoomSound speakers that project music in the correct direction, LG is busy spitting the jams from one speaker embedded in the back cover. It’s a powerful tweeter, sure, but awkwardly placed. LG uses the same curved plastic OLED display technology, but gives the Flex 2 the 1080p, full HD boost it deserves. More pixels combined with the smaller 5.5-inch display leaves us with 403 pixels per inch, not the original’s jaggy-ridden 245ppi. That’s a real reason to buy this phone. The screen looks like it has 2.5 times as many pixels, because, well, it does. Less important, and not a real reason to buy it, is the “immersion factor.” I found myself sucked into games a tiny bit more and, in landscape mode, the phone offers just the right bezel-to-screen ratio. It’s easier to see in sunlight too, but its value is negligible. Extra pixels are nice, but 1080p should be good enough for everyone, whether or not they’re stuck using Apple devices (that’s the max “cutting-edge” resolution for just the iPhone 6 Plus). The jump from 720p to 1080p is more significant to the human eye than the trendy move to 1440p, anyway, and the G Flex 2 screen offers more durability. Its specially coated Gorilla Glass 3 treatment, dubbed Dura Guard Glass, makes it 20% more durable, and the curve makes it likely to survive drops 30% more than flat phones. That’s something that can’t be matched. Not yet at least. At CES 2015, a few days into the new year, LG had joked that the LG G Flex 2 was the fastest device of 2015. All jokes aside, the specs, backed up by benchmarks, make that the partial truth. LG’s curved phone straight-up beat every other smartphone in our speed test initially, thanks to its first-ever use of the speedy Qualcomm Snapdragon 810 processor. It’s the chip maker’s latest 64-bit, octa-core system-on-a-chip with a clock speed of 2.0GHz. This blazing-fast CPU, combined with 2GB of RAM and an Adreno 430 graphics chip that’s 30% faster than the GPU in the original G Flex, achieved a Geekbench 3 score of 3,506 at first. That would have handily beat the top-performing Samsung Galaxy Note 4‘s 3,351 score. Then I ran the test again. 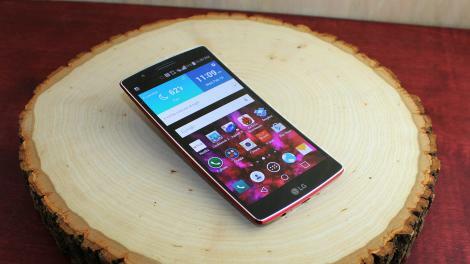 The LG G Flex 2 score dropped to a still admirable 3,145. Okay, still in the ballpark. A third test drove the score down to 2,931, a fourth to 2,656, a fifth to 2,224 and a sixth to 2,191. You get the picture. It became nearly as slow as the LG G Flex (2,067). These topsy-turvy benchmarking scores didn’t affect my 3D gaming video watching exploits using the imported phone. Menus would stutter here and there, which is always annoying, but its overall performance was relatively lag-free. Instead, the LG G Flex 2 became hot around the back cover’s power button and volume keys. At times, I couldn’t turn the display brightness up past a certain percentage because the device needed to cool down. However, this has been a common protection of past LG smartphones too. Wouldn’t you know it, by taking a short break, the score shot right back up to 3,427, which is more in line with how we expect the new Snapdragon 810 processor to perform. This led me to think that the chipset is experiencing overheating issues, but LG suggests that it’s likely related to the software and can be fixed post-launch. “The devices sampled are representative of final industrial design and user experience but are continuing to undergo additional optimizations to enhance benchmark performance,” an LG representative told TechRadar in a statement. In the future, once Snapdragon 810 becomes stabilized, it will compete with other top mobile CPUs including Samsung’s Exynos chips. It should get even better, too, as 3GB of RAM is included in the souped-up Flex 2 model with 32GB of internal storage. I tested the 2GB RAM model with 16GB of space, which is expandable up to 2TB via a microSD slot behind the back cover. As novel as the LG G Flex 2 is in design and performance, one of the most important features at its core is making calls. Luckily, there are no ups and downs here. Conference calls went on without a hitch when I used the phone normally, and the microphone was positioned closer to my face. That theoretically gave me a call quality compared to a candybar-style phone, like the iPhone 6. No one reported hearing a difference, of course. The speakerphone was also adequate, though I still don’t appreciate hearing all of my calls via the backward-facing speaker that’s within the Flex 2 back cover. For those still waiting to upgrade to Android 5.0 Lollipop, the LG G Flex 2 is a shortcut to unlocking the newest version of Google’s mobile operating system. The phone comes with the OS pre-loaded and is a huge improvement over the original LG G Flex that used the LG G2 interface. It actually comes with Android 5.0.1, but you wouldn’t know it, as visual draws of the Nexus 6 are masked by LG’s own Optimus skin. That means, while it has a lot of the behind-the-scenes benefits of the new Android update, the interface looks almost exactly like that of the LG G3. Lockscreen notifications are the biggest change on the curvy phone. They can now be read as you enter a lockscreen password like the LG’s tap-initiated Knock Code. The bottom home screen buttons that reflect Google’s latest design guidelines and the “clear” button at the bottom of the notifications panel represent smaller alterations. Sliding left on the concave screen pulls up LG-exclusive widgets like its exercise-focused Health service and Smart Tips tutorial. Both are skippable. One of the best fitness trackers we have reviewed will do you a lot better with a modern user interface. Sliding down from the top when the phone is unlocked reveals a combined quick controls and notifications menu. This is actually faster than Google’s decision to force users to swipe twice (or with two fingers simultaneously) to access quick controls for WiFi, display brightness and Bluetooth. Sliding down from the top when the phone is locked lets you peek at the time and date. It’s provided me with a fast time check without forcing me to unlock the phone or kill the battery with the entire screen illuminated. I also really liked how I could set a home time and local time here, good when crossing country border in different time zones. I also fully appreciate LG’s decision to add an easy way to change the main volume and also dive into a volume submenu to adjust the ringtone, notifications and multimedia sound separately. There’s nothing I hate more than turning the volume all the way down on my Nexus 6 only to play a blaring YouTube video in the middle of the night because the hidden-away media volume slider was still cranked all the way up. LG G Flex 2’s curved display doesn’t feel dramatically immersive for movies compared to any other smartphone I’ve tested. However, it’s new 1080p resolution and 16:9 aspect ratio make it a multimedia treat nonetheless. The 5.5-inch size isn’t a big letdown either, despite the fact that I was previously using the much larger Google Nexus 6. The sound is my only complaint for movies and all music. The backward-facing speaker shoots audio in the wrong direction. The sound didn’t make me want to stop streaming Netflix, but it did make me want to reach for a tablet. There are no better signs than when a big smartphone makes you use your tablet less or stow your earbuds because the quality is just that good. In this case, LG gets it half right. Playing games from the Google Play Store wasn’t a problem, even though the Snapdragon 810 processor speeds were all over the place. It didn’t slow down my 3D racing skills in Asphalt 8: Airborne. In fact, I bested my lap time. This is where the curved display of the LG G Flex 2 is a little more immersive. By focusing on the screen so intently, I got a little sucked into the game. It wasn’t revolutionary and certainly not a reason to spring for a more expensive phone. But the bend, combined with the proper bezel size that didn’t interfere with the touchscreen, made it marginally superior for gaming. The LG G Flex 2 acts like it’s the curved version of the LG G3 when it comes to the camera specs. They’re exactly the same and, in turn, much better than the first LG G Flex. Alright, it’s the same 13-megapixel image sensor as before. But now we’ve got ourselves a competent camera with LG’s speedy laser autofocus, optical image stabilization and dual LED flash. Whether the picture-taker’s hand is shaking or the subject is moving, this camera does its best to remedy the situation. The image quality is right up there with current LG’s flagship. The default camera app from LG is still straightforward without manual adjustments. Instead, returning modes let you get creative with panoramas and dual-lens shots that use the rear and front 2.1-megapixel camera, which never quite works out. Post-shot focus adjustments seems to have been axed from the app as a mode. New to the LG G Flex 2 is the, for better or worse, increasingly-important selfie camera software, or at least one change to the routine. I was able to snap a selfie by holding an open hand and then forming a fist in the air to trigger the convenient three-second timer. Moving the phone from a high to a low angle to review the shot, the app automatically slides my photo into view, detecting my quick arm motion. It’s just that much faster for me to delete the hideous photo. I like this natural photo review process, which LG dubs “Gesture Shot,” when using the front-facing camera. I still can’t stand the skin smoothing slider that is automatically set to a medium four (out of eight). This “beauty bar” looks like every selfie I take is airbrushed in the worst possible way. Of course, reducing the slider to zero every time and taking a comparatively gritter-looking photo leaves me not wanting to take selfies at all. Maybe that’s for the best. The LG G Flex 2 camera features the same image sensor as the LG G3, which features the same image sensor as the G Flex, which features the same image sensor as the G2. But there have been like the G3, this curved phone features OIS+, a laser autofocus and a better selfie capture mode. The G Flex 2 is better than its curved predecessor in every way save for battery life. It packs a 3,000mAh battery instead of the larger 3,500mAh size in its predecessor. You’re not going to get two or more days from this handset, but are in the clear for all-day moderate use. TechRadar’s smartphone battery life test proved it to last much longer than the LG G3, which also packs a 3,000mAh battery. Running a looped HD video for 90 minutes, the battery drained by 13%, while the G3 went down by a whopping 30%. The difference? LG G3 is firing up way more pixels on account of its energy-sucking Quad HD display. Plus, to a lesser extent, it’s not running the better-optimized Android 5.0 Lollipop OS. The 6-inch LG G Flex from 2013 dropped by just 6% from a full charge, but the rule of thumb is bigger phone size, bigger battery. The shrunken LG G Flex 2 had to compromise on the size. I just wish LG didn’t also settle on a non-removable battery. While the curved phone’s back cover can be taken off to access the microSD card slot, there’s no way to swap out the battery. On the plus side, the LG G Flex 2 now features fast-charging capabilities via its included travel charger. It’s akin to Motorola’s TurboCharger for the Droid Turbo, Moto X and Nexus 6. It charges 50% in 40 minutes, and I was able to reach a full charge in 1 hour and 38 minutes from a completely drained battery. My smartphone, unlike my cat, always seems to drop right smack on its face. I have broken the glass that protects the precious screen before. My phones certainly don’t have nine lives, but, thanks its curve, maybe the G Flex 2 has a better chance at survival. There’s a lot to like about the LG G Flex 2, and thankfully most of the perks have to do with the specs and similarities to the LG G3. It doesn’t just rely on the curve this time around. The G Flex 2 has some muscle to it. Under the right conditions, it has the fastest processor of any smartphone and ports over LG G3’s camera with an excellent snap-and-review selfie feature. Android 5.0 Lollipop is here in limited form, but that includes the decidedly clutch lock screen notifications. This phone has the brains, so it’s okay to pay attention to its slick-looking curvy features. Matching LG’s curved 4K TV shape and coming in at a much more reasonable 5.5-inches, the flexible 1080p display is as comfortable as it is durable. This second Flex has a much better shot of breaking out of the series’s current cult hit status. LG’s G Flex 2 is once again solving a problem that not everyone is clamoring to fix, as much as people spend money on cracked-phone replacements and cases to prevent future accidents. While the outside is trendy, the question remains: why not just go with the cheaper LG G3 or wait for the LG G4? The Flex 2’s chipset benchmarks are inconsistent at the moment, and the battery here isn’t swappable. The self-healing back doesn’t pass the scratch test either. In a year-and-a-half since the LG G Flex first launched, things have changed. Apple’s BendGate controversy became worldwide news, and now everyone’s mom and dad on their family plan has begun to worry about their phones breaking in their back pocket. That’s still not reason enough to spring for a curved, flexible phone. Instead, the more important development has been the significant specs bump found within the new LG G Flex 2. LG’s debut of the Snapdragon 810 chip, while inconsistent and running hot right now, shows promise. The 1080p resolution more than doubles the amount of pixels on a 5.5-inch screen that’s smaller and more manageable. Ultimately, the LG G Flex 2 is a trendier-looking LG G3 variant with the same great camera and better battery life than the first. If you don’t want to wait for the LG G4 and don’t mind paying a little extra, it’s time to take a chance on something new, and for interesting phones like the Flex 2 and the Samsung Galaxy S6 Edge to graduate from cult hits into the mainstream.